Okay how many of you are guilty of buying any of those 100 calorie snack packs thinking you were being healthy? Well, surprise....you're NOT! Those little packs are full of sugar, refined carbohydrates and empty calories that your bodies cannot use. They don't have an ounce of protein in them and all they will do is leave you feeling hungry and wanting more in an hour or so, if not sooner. And points? Well sure they're only a few "points" but what does that teach you? Nothing really. Just that you can eat foods that are low in points but it doesn't mean you're making good choices or eating healthy! But, enough of my WW rant. Let's get to the real point of this post....the recipe for these delicious Shakeology Protein Snow Balls! THESE (and their chocolate counterparts found here ===>>>> RECIPE) are what I like to reach for when I'm hungry and want something sweet. They're dense, nutritious and CLEAN! Not to mention they're easy to make and involve no baking! So, have at it and tell me how you like them! Combine vanilla Shakeology, almond flour, and oats in a medium bowl. Mix together. Add almond butter and almond milk and mix well with a rubber spatula or clean hands until it forms a thick batter. Roll mixture into 15 balls, each about 1-inch in size. 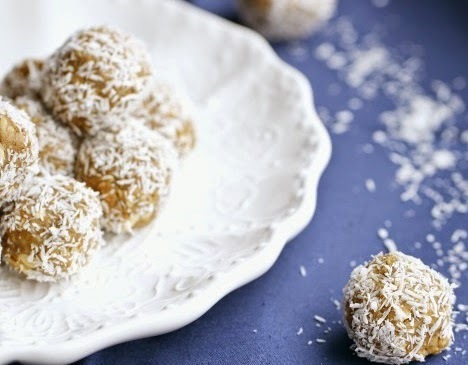 Roll balls in coconut (optional).